The Press Democrat published a great story in Sunday's paper profiling Alexander Valley winegrower Tom Rued, who is trucking in recycled wastewater from the city of Healdsburg to irrigate their vineyards. 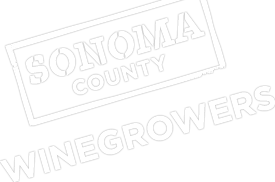 This is a great example of how Sonoma County's winegrowers are being proactive to reduce water use during this drought. To get a sense of how the state’s three-year drought has created a new normal in the wine industry, consider the truck that Rued Vineyards purchased this year. Almost daily, Tom Rued would drive the stainless-steel tanker, with a capacity of 6,400 gallons, about 15 miles to a city of Healdsburg filling station to load up on recycled wastewater. The entire operation takes about five hours, including the round trip between the Alexander Valley vineyard and the plant, the time filling up the tanker, and offloading the water into a drip irrigation system to keep 19 acres of sauvignon blanc vines moist enough to make it through another harvest.